If you've got kiddos, you probably already know that a giant cardboard box opens up a world of creative opportunity. Last week, my husband brought home a super sturdy box that has made our family room into an amusement park for our lil' darlings. 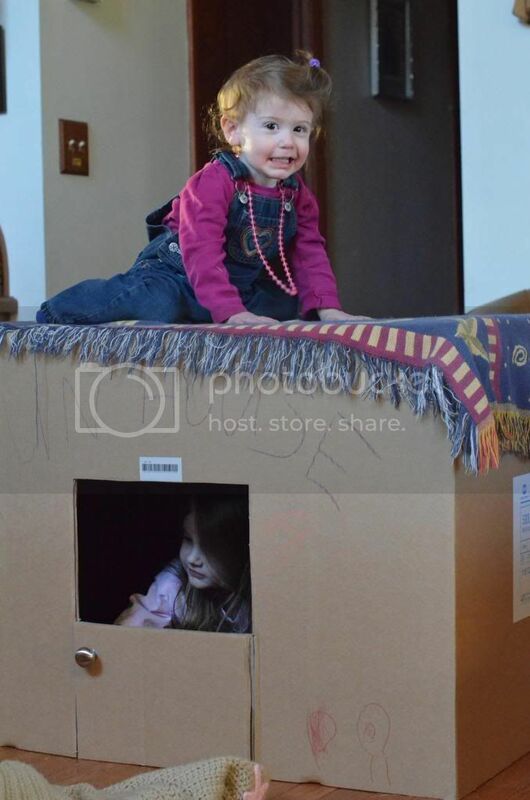 Here are 10 fun activities to change a simple cardboard box into a kiddie wonderland. 1. Throw a blanket over the opening and create a fort or a great hiding spot for Hide-and-Go-Seek. 2. 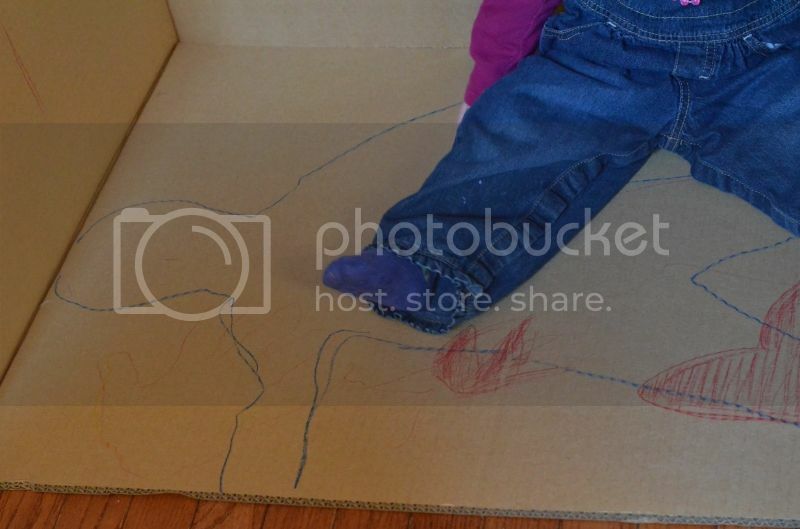 Trace the outline of your child's body on the floor and then color it in or draw clothing/accessories. 3. Get creative! Add artistic designs to any or ALL sides of your box to make it unique. 4. Cut a hole in one side and watch what unfolds. 5. 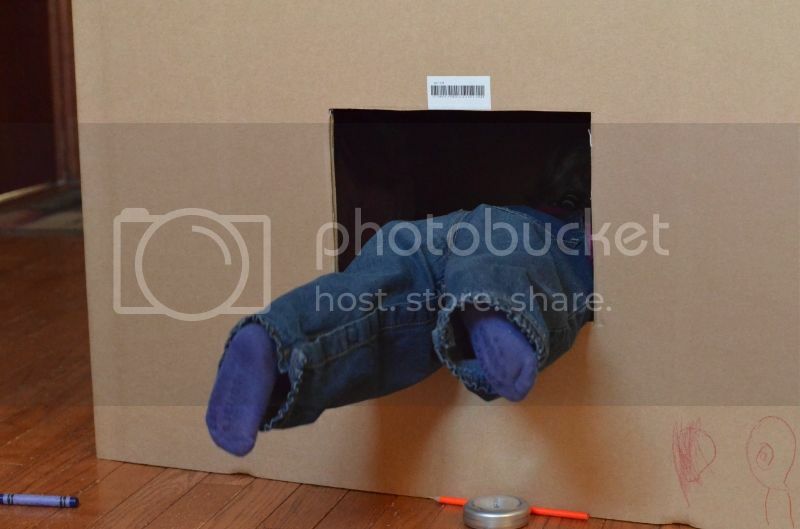 Move the hole to the TOP of the box and let your kiddos be Jack-in-the-Box characters or put on fun shows with puppets...or their own goofy heads! 6. Agility training? Make sure your box is strong enough to hold your child's weight if you have lil' monkeys like ours. 7. 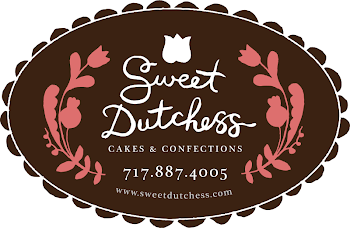 Add a Dutch door and a doorknob to make the box feel like home! A Dutch door will create a fort-like feeling and will still allow light in. We also added an additional window on the side wall. play Santa, reindeer and chimney sweepers. Although our daughters don't know Godzilla or King Kong, I assure you that they channeled these characters as well. 9. Nighttime fun! We gave the girls flashlights and headlamps and stuck a portable touch light on the ceiling of their house so that they could play inside at night. They love sneaking into their fort to play in the evening hours. 10. Add a mailbox! The girls' Auntie made them the sweetest little mailbox and left them "mail" to read when they'd return to their house. 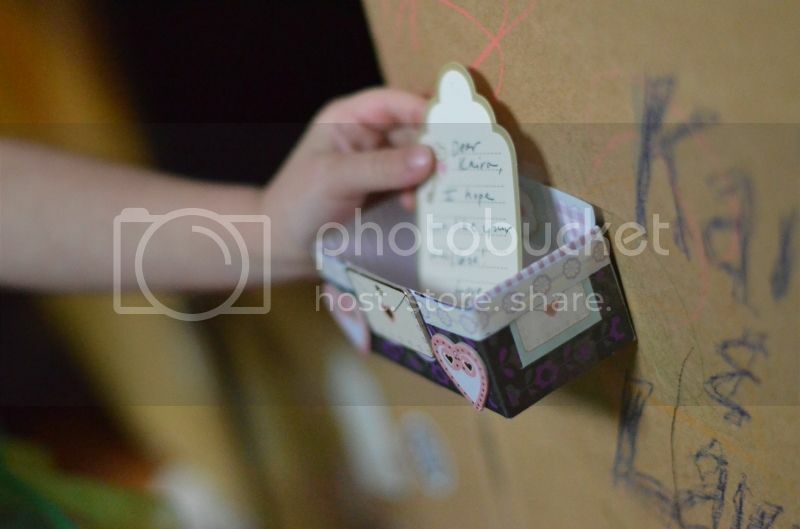 Both the adults and the girls write notes back and forth to leave in this adorable letter box. We all love this addition! Only 10 ways to rock out a cardboard box? Pffffft! No way. The possibilities are endless, but I can't keep ya reading all day here. Our "Fun House" is still taking up space in our family room, but loaded with pillows, blankets and toys, with pictures taped to the walls (that the girls drew themselves)- we're having a hard time getting rid of their new playhouse. Each day, it seems that we add something new to this ol' cardboard box...and each day it brings big smiles to our lil' cuties. Our most creative feat will be figuring out how to eventually get RID of this wacky fun house. We're open to suggestions! Have an artistic and inventive day! What other ideas do you have for a plain ol' cardboard box? i love this! Love how resourceful you and Lee are and love the fun ideas!